Stranded on the road due to a motorcycle breakdown? Don’t worry! South Jordan Towing is there to help you out with the best motorcycle towing services in the whole of South Jordan Utah and surrounding areas. Imagine yourself being stuck in the middle of nowhere with your motorcycle. It doesn’t even matter if the road where you have been stranded with your motorcycle is a busy one, until and unless you find any hope to rescue. The thought is not just concerning but risky too. You can land up being in this situation anytime and any day. It can be frustrating to be stuck in this crisis for long hours. In this scenario, South Jordan Towing can help you out to tow your motorcycle till your destination and eliminate any chances of danger. We are always there to provide you with our motorcycle towing services in South Jordan Utah and the surrounding areas. You just need to get in touch with us and the rest will be our responsibility. 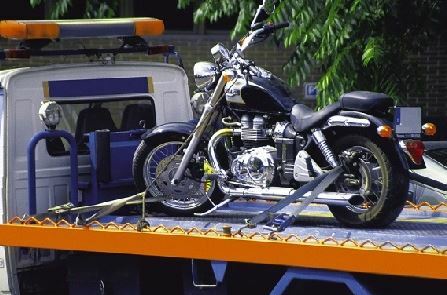 WHY CHOOSE US FOR MOTORCYCLE TOWING? QUICK – By choosing South Jordan Towing to help you out towing your motorcycle, you can be assured of a timely service. What makes us stand out as a towing company in the whole of South Jordan Utah is our instant and quick service record. We are there for you immediately when you need us the most because we value your well being. By choosing us you need not worry about delays in your rescue. SAFE – Another factor that defines our work is an assurance of maintaining strict safety standards for our customers and their vehicles. While towing your motorcycle we make sure that it is handled carefully, doing away with any chances of damage. We use the best strategies to protect your vehicles from any damage while towing them from one place to another. So if you care about your motorcycle’s safety in any way, you must choose our motorcycle towing services now. AFFODABLE – Lastly the fact that makes our motorcycle towing quite exemplary is the minimum costs at which it is available to you. Therefore by choosing us you not only get back your vehicle in its perfect condition but also get to save a lot of money in your pocket. EFFICIENT – Our team at South Jordan Towing is highly efficient in dealing with all kinds of stowing services in South Jordan and surrounding areas. We make sure to leave no stone unturned in providing quality towing services to all our clients. So next time you find yourself stranded with your motorcycle on the road due to a breakdown, just give us a call. It may happen on your working schedule or on a weekend getaway with friends, but no matter what we will reach out to you with our towing truck well within time. Our entire team at South Jordan Towing is always looking forward to help you out to rescue with our motorcycle towing services whenever you need us the most.